Cloudy. High 58F. 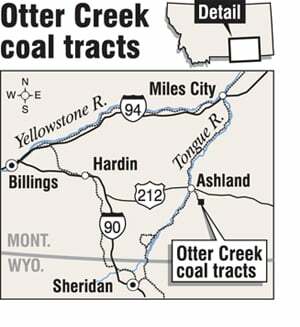 Winds NNE at 5 to 10 mph..
HELENA - The state Land Board Monday voted 4-1 to lease 572 million tons of state-owned coal in southeastern Montana's Otter Creek Valley - but set a relatively high minimum price to buy the rights to develop the tracts. The decision, which came after months and years of study, appraisals and political lobbying by all sides of the contentious issue, could be the first step toward developing a massive coal mine in the rural valley about 150 miles east of Billings. Yet developers have said any mine won't happen until five to 10 years in the future, and Land Board member Linda McCulloch noted that the board retains the authority to approve mining and reclamation plans on the land. McCulloch, Montana's secretary of state, made the motion to approve the lease, but set the minimum upfront "bonus bid" at 25 cents per ton. That amount is two-and-a-half times what Arch Coal Inc. agreed last month to pay for the right to develop 730 million tons of privately owned coal interspersed with the state tracts. "The only thing in common between the supporters and opponents of developing Otter Creek is that the state of Montana should not give this up for cheap," she said. "No sweetheart deal will be made." Monday's action gives coal companies until Feb. 8 to submit bids. The board expects to examine those bids at its Feb. 16 meeting. The board is composed of the state's top five elected officials. McCulloch, Gov. Brian Schweitzer, Attorney General Steve Bullock and state Auditor Monica Lindeen voted in favor of leasing the coal. State Superintendent of Public Instruction Denise Juneau voted against it, saying there's more value in preserving the land for future use than in developing a coal mine. "We could sell every parcel of state land and log every tree on state lands, but we don't," she said. "We don't because we want to sustain Montana's lands for future beneficial use. ... Of course there is value in mining the coal. But there is also value in keeping Montana ‘Montana.' "
The board approved the lease over the objections of environmental groups and some area landowners. Many of them attended the board meeting in Helena, giving impassioned speeches about how mining coal would harm the valley and adjoining river basins and hasten global warming, if the coal is burned to produce electric power. Among the opponents were several Missoula Big Sky High School students, who traveled to Helena with Spanish teacher Jay Bostrom. Bostrom said the lease has been advertised as a way to help school funding, but that he didn't want the money: "Don't do it to fund my computer, or my salary. ... I'll take a pay cut. As a teacher, I'm not interested in getting money from coal at all." "This will create an unlivable future for short-term gain," added student Kaelin Curry. Money from the bonus bid would go directly to public schools, but would not increase overall state funding - unless the Legislature authorizes the increase. McCulloch, a former teacher and state superintendent of schools, included in her motion a directive from the board that the minimum bonus bid of $140 million would be used to increase state funding for schools. She acknowledged later that the directive is not binding on the Legislature, but called it "a very stern reminder" to lawmakers. Any royalties from coal mining on state lands also goes into a state trust account whose interest helps fund schools. But, again, only the Legislature can decide whether any increased interest revenue would lead to higher overall state funding for public schools. Supporters of leasing the coal argued that it would be an economic boost for eastern Montana and the entire state, providing jobs and increased tax revenue. Cary Hegreberg, executive director of the Montana Contractors Association, said Montana has a good track record of responsibly developing natural resources, which provide good-paying jobs. The same people who oppose the lease have opposed virtually all natural resource development in the state, he said. "It's time to say yes to responsible development in Montana," he said. "We urge you to approve these leases." Attorney General Bullock tried to convince fellow board members to increase the minimum bid to 35 cents a ton, arguing that a railroad to the site would make the coal more valuable. But none of the other board members would second his motion.